You'll find Massachusetts has many options for medical assisting schools and job opportunities in the field. As a graduate of a medical assisting program in Massachusetts, you will have the chance to work in clinics, hospitals, and physician's offices as a medical aide, medical assistant or clinical practice assistant. Massachusetts medical assistant programs can be found in cities throughout the state at private colleges and universities, as well as vocational and community colleges. Many programs are also available online. Massachusetts is currently one of the top paying states for this profession, with a mean hourly wage of $18.09. Learn more about medical assistant training, search for schools and see what certifications medical assistants in Maryland can receive. In most cases, medical assistants need to earn a degree or certificate to start their careers working with patients in physician offices and clinics. They help physicians with examinations, give injections, measure vital signs and record patient histories, among other tasks. If you’re interested in a career as a medical assistant, the first step is finding the right program for you. 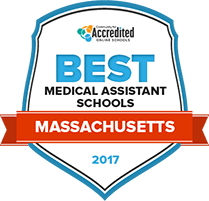 We’ve done the research, looking at student surveys, tuition rates, career services and class sizes to bring you our list of the Best Schools for Medical Assisting in Massachusetts: 2017. Start here for the best options in the field. An excellent way for students to begin a career as a medical assistant is to complete a degree in medical assisting with Mount Wachusett Community College. Students will develop skills in venipuncture, taking and recording patient vitals, and assisting with medical examinations and minor surgical procedures. MWCC honors credits earned at other institutions of higher education, allowing students to begin a MWCC program without having to retake any satisfactory previously completed courses. Students can utilize online, evening, and weekend classes to develop their academic schedule to fit around their already busy lives. Students who complete the medical assisting program with Middlesex Community College will have a competitive edge on other students looking to begin employment in a doctor’s office, clinic, or urgent care center. Students will work closely with professors with practical experience working in the medical field, allowing them to develop hands-on skills that are valuable to medical employers. Students attending Middlesex may also wish to add some variety to their degree program by taking online courses or summer and winter courses. Middlesex students will have access to a large selection of student services designed to ensure their academic success. Springfield Technical Community College offers medical assisting programs in the form of certificates and associate degrees. Either of these programs will be largely beneficial to students interested in beginning a career on the administrative side of working in a doctor’s office or medical clinic. Most credits offered at STCC can be transferred to other institutions of higher education, which gives students the peace of mind that all work they've put in will be acknowledged. Out-of-state students can even benefit from STCC’s degree programs by utilizing online learning opportunities. Numerous STCC scholarships and grants are up for grabs for any qualifying student. Massachusetts medical assistant schools offer diplomas, certificate and associate degrees. Finding a medical assistant school or program in Massachusetts is the first step to becoming an allied healthcare professional. Our search tools in designed to enable you to find a school in Massachusetts that matches your needs, interests and budget. How are the duties of medical assistants in Massachusetts defined? In Massachusetts, medical assistants are considered unlicensed assistive personnel (UAP). UAPs in Massachusetts, including medical assistants, can be delegated by licensed physicians to perform certain tasks according to state law and regulation. Generally speaking, however, a medical assistant is an individual who works in a hospital, physician's office, clinic or other healthcare facility. He or she is responsible for providing physician support to ensure the smooth running of the facility. They may also work in an administrative or clerical capacity. Certification for medical assisting is not mandatory in the state of Massachusetts, though it may be in your best interest to become certified as it is left to the discretion of the hiring doctor. The following certification options are available in Massachusetts. Some of these are available in other states as well. Certification achieved may be determined by medical assistant training program attended. Clinical Medical Assistant (CMA) Exam Administered by The Certifying Board of the American Association of Medical Assistants (AAMA). Registered Medical Assistant (RMA) Exam Administered by American Medical Technologists (AMT). The National Certified Medical Assistant (NCMA) Exam Administered by The National Center for Competency Testing (NCCT). The Certified Clinical Medical Assistant (CCMA) Exam Administered by The National Healthcareer Association (NHA). Although formal education is not required, formal training is necessary in order for a medical assistant to perform certain medical support services. You will find medical assistant training programs in Massachusetts at diploma and associate degree levels. Diploma programs usually take a year to complete, while associate degree programs usually take two years of fulltime study. Are there tasks outside the scope of medical assistants in Massachusetts? In Massachusetts, a medical assistant who is working in a clinic is not allowed to administer injections. However, medical assistants who are working in a private office are permitted to administer injections. The following 2014 salary figures from the Bureau of Labor Statistics (BLS) offer a comparison between medical assistant earnings in Massachusetts and nationally. Salaries in Massachusetts for medical assistant jobs can vary by thousands of dollars a year depending on location, illustrated by the 2014 wage amounts from the BLS shown in the table below. The highest paying areas are located in or around Boston and Cambridge, while New Bedford and North Central Massachusetts have considerably lower wages. In Massachusetts, medical assistant jobs are projected to grow by 18.5 percent from 2012-2022. One of the main reasons for this rapid expansion is the growth of the baby boomer population and their increasing need for preventative healthcare. The table below compares Massachusetts medical assisting job growth with national growth. There is a big selection of medical assisting schools and programs to choose from throughout Massachusetts, including universities, community colleges and vocational school. See what this spotlight school offers its medical assistant students. Bunker Hill Community College is accredited by the New England Association of Schools and Colleges, Inc., through its Commission on Institutions of Higher Education. This up-to-date blog gives information on the legalities of medical assisting in several states, including Massachusetts. Members can find information on upcoming events and meetings along with an event calendar and information on becoming a medical assistant in Massachusetts. Find out about medical assisting and salaries in Massachusetts, and search job listings. ARMA is a national registry, which provides membership to medical assistants throughout the USA. Their aim is to advance the status and professionalism of medical assistants within many allied health professions.